Livingston moved to the top of Betfred Cup Group F after defeating Annan Athletic at their temporary home at Linlithgow on Saturday. In the first of two matches at the Lions’ temporary home it was player-boss Kenny Miller who struck the only goal on 14 minutes to seal a narrow victory and move his side to the brink of the knockout stages, despite a late red card for Ricki Lamie. Miller made two changes to his side from the penalty shootout win at Hamilton on Tuesday night as Craig Sibbald and Jack Hamilton replaced Lee Miller and Nicky Cadden. Annan boss Peter Murphy stuck with the same side which defeated Berwick convincingly in the mid week fixture at Galabank. It was the visitors who had the first chance on seven minutes when Scott Hooper tried his luck from the edge of the box but his side-footed effort was well saved by Liam Kelly. 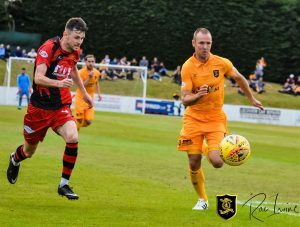 The Lions took full advantage as they broke the deadlock seven minutes later as Miller latched on to a long Craig Sibbald ball to beat Annan keeper Alex Mitchell, finishing confidently to round the Annan keeper and roll the ball into the empty net. Ryan Sinnamon picked up a yellow card for a trip on Sibbald after 20 minutes before Callum Crane burst forward from left-back before trying his luck with a long-range effort that flew over the bar. That was the last moment of note in the first half as the Lions went in at the interval with their narrow lead intact. The second half started with a yellow card for Annan’s David Wilson for a lunge on Sibbald before the Lions came within a whisker of doubling their lead moments later when Scott Robinson cut the ball back for Miller but the low shot struck the post. Hamilton then came close to a goal of his own on 65 minutes as he thundered an effort on goal but the post came to the visitors’ rescue once again. Annan finished the game more adventurously as they committed more men forward in an effort to square the match and the final ten minutes proved to be an anxious spell for the home team as Annan came close on a couple of occasions with an Aidan Smith shot being cleared off the line and as Annan forced a couple of corner kicks Peter Watsons net bound effort was also cleared off the line. It was a nervous finish for Livi on 87 minutes as Ricki Lamie was shown a straight red card after catching substitute Ross Fergusson with a high with a mistimed tackle. Annan must now take something form their midweek fixture up at Airdrie on Tuesday evening if they are to have a chance of progressing to the knock out stages of this competition. Livingston – Liam Kelly, Rickie Lamie, Craig Hallket, Declan Gallagher, Shaun Byrne, Scott Pitman, Craig Sibbald (Keaghan Jacobs 85 min), Callum Crane, Scott Robinson, Kenny Millar (Alan Lithgow 92 min), Jack Hamilton (Jack McMillan 76 min) Subs not used. Steven Saunders, Mathew Knox, Ross Stuart, Cameron Clark. Annan – Alex Mitchell, Scott Hooper, James Creaney, David Wilson, Ayrton Sonkur, Peter Watson, Tony Wallace ( Aidan Smith 45 min) ,Ryan Sinnamon, Tommy Muir, Scott Roberts ( Owen Moxon 69 min), Chris Johnston (Ross Ferguson 59 min). Subs not used Robbie Minto, Jack Brannon, Peter Murphy.